1 Don’t touch anything during one minute. 2 Press the Red Button 20 times. 3 Press the Red Button. A switch appears. Turn it on and press the Red Button again. (132231) Enter the code. Two new panels show up: Four Green Buttons and the Lever. Move the Lever to the left, number panel will appear. Two codes can be entered to this panel. 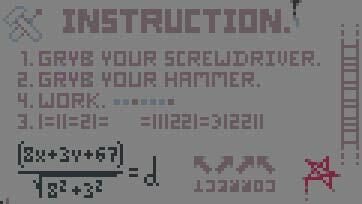 See the equation in the lower-left corner of the Instruction Poster? That’s where the codes are. 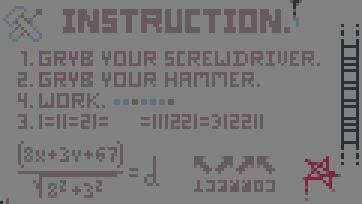 You don't actually have to solve the equation, it already contains two sets of numbers - 8367 and 8232. Enter 8367. Two more panels will show up: 49 Buttons on the left and 1234 Panel on the right. About Left panel: five correct buttons must be pressed. For this one, hints are the pentagrams scattered on the console. Press the buttons as shown on the picture below. NOTE: there is no difference between normal and flipped pentagrams, both trigger the same ending. 5 Press the Red Button 15 times. A drawer with a hammer in it opens. 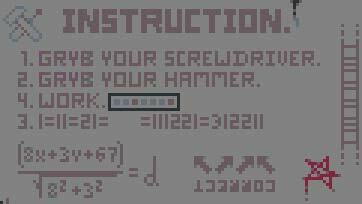 Use the hammer on the game’s screen then press the mysterious button. NOTE: after this ending, the game must be restarted by the player. 6 Back to Number Panel (0 -9) that appears when moving the Lever to the left. Enter the other code from the equation – “8232”. A panel will show up with a date and two arrows. Press the Left Arrow. 8 times to open the drawer with a screwdriver. Take it and point on closed lid at upper right corner. It unveils 4 colored buttons. The solution is once again on the Instruction Poster. See the "GRYB". It's not "GRAB" written wrong, it stands for: Green-Red-Yellow-Blue, which is the colour code to enter. 9 Remember when you entered 8367 on the Number Panel, there was a "1234" button set at the lower-right corner? (refer to 4)). The solution is simple - take a look at the steps on the instruction. It doesn’t list “1234” but "1243". That’s the code. 10 Let's get back to the point when Four Green Buttons and the Lever show up (after entering “I III II II III I” “132231”). Turn the lever to the right. A "0-1" panel appears. Hint for that one lies in little squares near the "WORK" word. Blue ones stand for 0, red ones stand for 1. So the combination is 0010001. 11 The answer for the Four Green Buttons riddle lies in the arrows. They show which buttons must be pressed: upper-left button first, then upper-right, upper-right, upper-left. Solution is - First is one(1) = then one(1) one(1), second segment says what was in previous one = then it's two (2) ones(1), as it was before = then goes an empty space. There should be one (1) two (2) и one(1) one(1). So the code is “1211”, enter it on "1234" panel. Enter it. A musical panel appear on the left. Now listen closely to the music. You will hear a repeating melody. Reproduce it on the musical panel. In a hurry? Alright, here it is: right-right-middle-left-left-left-middle-right. 13 Back to the screwdriver. Press the Red Button 8 times for it to show up. Take it and use on the wires under the monitor. A little screen will appear. Now enter the "I II III" and pay attention to the "DON'T DO IT!" sticker. Click it 4 times, it will unstick and you'll see the name of Leonardo Pisano. If you don't know who he is, google it and you will discover that he is also being mentioned as Leonardo Fibbonacci, an Italian medieval mathematician, who is known for the “Fibonacci numbers”. You should enter first 9 numbers. So pull the lever to the left and enter "011235813" on the "0-9" panel. 14 Four Green Buttons hide yet another solution. The hint for that is writing "Correct" under the arrows, but it's flipped vertically and horizontally. If you flip the arrows the same way, you'll get the right combination: a lower-right, lower-left, lower-left, lower-right. On the right part of the console, a new panel appears. It has two buttons (grey + red) and a counter. See the number written below it, “276”? That’s the number of time you must press the grey button. Once 276 is shown on the counter, press the red button (on the counter, not the big one). 15 This ending is slightly different than the others, you've probably seen it already. Every time you press restart there is a chance of getting "Bomber" game. Press the red button to drop the bomb. The point of the game is to destroy all the buildings and land the plane. To get this ending, just press restart until you get the game and then beat it. 16 After completing every one of previous endings you'll get this. A last one. The dialogue at the beginning will be different. after you press the Red Button, you'll get final ending. 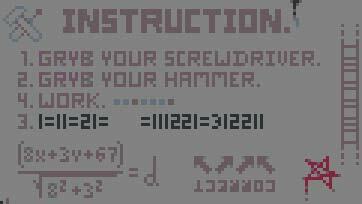 17 Click 15 times on the Red button until the hammer appears. Grab the hammer and hit the Red Button three times with it. A bloody embryo appears. Hit him once. More bloody things will appear on the panel. Beat them then hit the embryo again. Repeat the process for each following waves. 18 Press the Red Button 8 times . 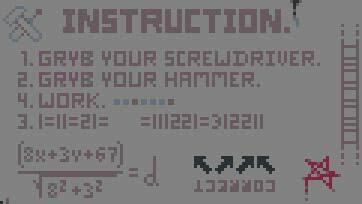 Grab the screwdriver and use it on the Instruction Poster. This enigma is solved by setting the OS clock to 00:00. Clocks will then be greenlit and a card showing a code is printed. The card must be read bottom-up. The code must be used on the “I II III” panel. 19 Click on the Red Button twice and enter “I III II II III I” “132231”. On the 4 Green Buttons panel, input lower-right, lower-left, lower-left, lower-right. On the right part of the console, a new panel appears. It has two buttons (grey + red) and a counter. This time, click 666 times on the grey button. Once it’s done, click the red button above the grey one. A new panel appears with multiple icons on it. Turn off all icons except Key, Eye, Two Waves and Hourglass to unlock this ending. Those are the signs which appear during the “Illuminati” ending (see ending 5 of this walkthrough). 20 Once the Red Button has been pushed a hundred times in total (across multiple “runs”), hitting the “Restart” button will result in the screen displaying “Awaiting Input”. Click on the Red Button. New Red Buttons appear. Click on all them. Repeat until the new ending triggers. 21 NOTE: this ending contains a reference to the game “Papers, Please”. Papers, Please developer Lucas Pope has been contacted by Four Quarter and gave his permission for this cameo. Once 10 endings have been unlocked, a passport will be visible on the bottom right corner of the screen. Clicking on it will make it fly to the panel. Two stamps will appear on the right. Clicking the red stamp will trigger an ending. Clicking the green stamp, the game continues as usual. 22 This one is the most complex enigma of the game. It relies on elements of other endings to be solved. Push the Red Button 8 times, grab the screwdriver and use it on the top right panel (the one with the screws) to access the 4 Colors panel. 4 Colors panel: press Yellow, Red, Blue, Blue. 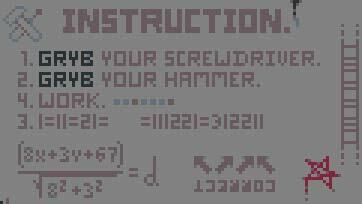 This hint comes from the end of the bomber mini-game where “You dRop all BomBs” is displayed. A new panel appears. Input the “I III II II III I” “132231” code. Behind the “Don’t Do It” panel appears the number “4020” (from previously unlocked posters). “4020” must then be entered on the 1-9 panel. The 4020 number is a reference to the Book Of Job (which mention the Leviathan, a relevant information given the ending that will be displayed). Yet another panel appears, but a piece is missing. Pressing the Golden button does nothing. On the 4 Green Button panel, input lower-right, lower-left, lower-left, lower-right. On the right, a panel with “D4” written on it appears. 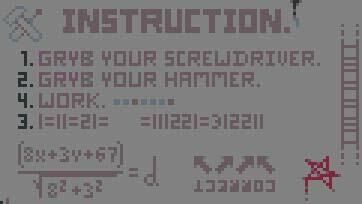 Grab the screwdriver and use it on the instruction poster to see the “B, D1, D7, 4” inscriptions. Those correspond to coordinates to be entered in the matrix panel already used for the satanic ending. To reveal the Matrix Panel, enter “8367” on the 0-9 Panel. Click on the panel as on the picture above, and click on the middle button. The D4 panel will open. Grab the diamond and insert it right to the Golden Button. Click on Golden Button to unlock the ending.